Ascending Butterfly: #ad: @JENGA is a 2015 National Toy Hall of Fame Finalist Help them win the @museumofplay #toyhalloffame top honor! #ad: @JENGA is a 2015 National Toy Hall of Fame Finalist Help them win the @museumofplay #toyhalloffame top honor! I remember those days fondly and while you all know I'm an avid tech enthusiast I do fondly recall simpler days of play, when the most 'technical' game I knew was 'Operation'! and before the Atari hit my radar, games like JENGA is what game night was all about and I definitely want to see classic toys introduced to newer generations. I have to admit often times my friends pets would knock down many a game, at that crucial moment when you all knew there weren't too many 'good moves' left - an exuberant pup or attention seeking cat would knock the game down at just THAT moment. Diffusing the tension with gales of laughter that was just as fun as the game itself. Sometimes we would start games over multiple times only to have a pet (or a kid brother or sister for that matter) knock it down and no one find out who that days 'loser' would have been. Our friends at JENGA need YOUR help. This isn't for prize money, they don't get a 'prize' for winning, they get bragging rights - hey much like the game itself right?! 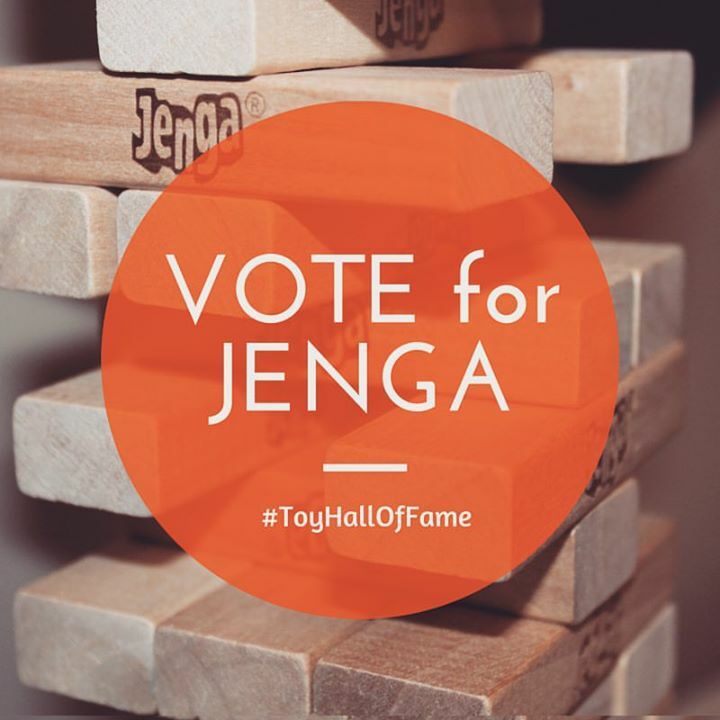 JENGA is in the running for the 2015 National Toy Hall of Fame, they are a finalist and they want your vote! With 30 years on the shelf, who doesn't have a great JENGA story to share? When you visit www.toyhalloffame.org you will see a big blue box, under that box are purple banner tabs the one on the right reads 'Choose Your Favorite Toy Hall Finalist!' Press the button that says JENGA then hit Submit, you can take this poll once per day - the winner will be announced on November 5th. It's a super simple quick click right on the homepage of the Toy Hall of Fame website and NO personal info or email address required to vote, how easy is that? I think one of my fave things about JENGA is how it 'grew' with us and was just as fun when I got older as it was when I was little. There is just something about a classic game night that never grows old for me. I still have them with friends and family. My fondest memories of Thanksgiving and Christmas Eve Family Gatherings was playing games with my cousins while we waited for the big family dinner. And on Christmas Eve while the city was blanketed in white and we were waiting for Santa and counting the seconds until midnight when we were allowed to open ONE present we were always playing board games. If you don't want to see classic board games disappear be sure to give them as gifts too, introduce your child, nieces, nephews, and god-children to the joy of a classic board game night if you are not doing so already. I hope you will consider giving JENGA your super quick vote! What was your favorite classic board game as a kid? Did you/Will you vote for JENGA? We have a Red Sox version of Jenga and it's one of our favorite games to play! We play it almost every week. Jenga is a super fun game my family will never get tired of. Jenga is the best game of all time! I can't count the number of times I've lost, but I still love it. Jenga is such a fun game whatever your age :) I still enjoy playing it with friends. Jenga! Oldies but goodies game ever. I have this when I was younger and those moments are so precious to me. Childhood days. We love Jenga. We actually added directives to each of the pieces for our preteen ministry, and when they'd pull one out, they were asked to do what it said. Pretty neat! I voted. My boys love this game! JENGA!!!!! i love this game! it was always a big hit for game nights! voted! We love Jenga in our house! We love to play it on family game night. Oh ya! Jenga, I used to love this game when I was a kid. I can't believe we don't have that in our home. I have got to go get it now. As a kid I never played Jenga, but we did play other board games, and we enjoyed that. Who doesn't remember Jenga it has a timeless appeal that can never be replaced. My kids love Jenga! It's so much fun! I played Jenga as a kid, and I now play it with my 7 and 5 year olds! Classic game that is super fun and strategic! Aw, WE LOVE JENGA! I definitely would like to try this version! I remember when I was around my children's ages now that I wanted Jenga so bad. It's such a fun game. I must honestly say that i don't think I have every played this came. But the excitement being expressed here makes me want to play it. the jenga app is nothing like the actual physical jenga game. It definitely deserves entry. It's a total classic and so many people's favorite! Jenga is really a fun age I remember when i was young i will enjoying it. Jenga! this post brought back some great childhood memories! one of the best games of all times! I loved this game! Me and my neighborhood buddies would spend hours on end playing it. I might get myself a new set. Nothing beats reliving the good old days! Jenga was one of my favorite games before. I can't remember the last time I played it. I would love to have this again at home for me and my family. This is such a classic and will always be one of my favorites. My friends and I played this a lot even when we were in college. YAY for non-virtual games. I would love for the younger generation to play Jenga. We have this before, my cousin and my siblings enjoyed playing Jengga. I have no idea about the Jenga but my childhood memories is filled with fun outdoors. Kids these days are so different with so much love for gadget. Jenga is such a fun game to play with family and friends. It's very addicting too, lol. I remember playing this non-stop! How did I not even know there was a Toy Hall of Fame! I need to check this out and see if any of my faves made it!! This game is so fun! My kids are going to love playing this game! I just ordered Jenga today. I can't wait for it to arrive. :) I saw a lifesized one somewhere (media), but I can't remember where! This is our annual after Christmas dinner game. I've seen that game being played on the Ellen Show and I've been wanting to play it. Thanks for the reminder. I'll get me one for us to play soon. Jenga is such a classic!!! We have it and always break it out when we do family game nights! The Toy hall of Fame is right in my backyard! I love going there, it's fun to see who gets in each year. I haven't played Jenga in such a long time! I need to get one, I would love to play this game again! I used to love playing Jenga. We still have it somewhere. I think my son would enjoy it now. Jenga is such a fun game whatever your age! We recently bought the Boom version, my son loves it! I use to play Jenga with my sisters. We really enjoyed it. These days I don't see many kids playing, but I think I'm going to buy Jenga for my son and I... I think he's enjoy it. Jenna is so much fun! I haven't played forever:-) it's a great group game! Thanks for the walk through memory lane! Believe it or not, I actually have never played Jenga before. That shall change someday! I love love Jenga! It's been so long since I've played, I need to break it out again! I love playing Jenga! It's such a fun game!!! Love Jenga yet it haven't played it in awhile .My kids use love to play as well . Think i'll get a new Jenga and make a family night ! Thanks for reminding me of all the fun we use to have !! Wow, Jenga brings back so many memories! I know my kids loved playing it and it was also one of those church and/or youth group fun activities, too. Jenga is one of my favorites! I love Jenga! I hope they win!